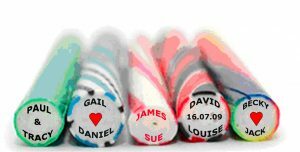 The-Rockshop.com specialises in Wedding Rock, Wedding Sweets, Customised Rock, Promotional Rock and Promotional Sweets, We are the UK market leaders in this field and we have the best prices. The Rock Shop is situated on the seafront at Morecambe and we have been in this business for 42 years. The Rock Shop is a trusted family business, and you can get in touch with us via phone, email or mobile using our Contact Us page. We hope that you enjoy using our website site and ordering your wedding or promotional confectionery – if you have any questions or require assistance, please don’t hesitate to get in touch with us. At our associated company The Rock Works we provide Customised Rock, Promotional Sweets, Customised Kendal Mint Cake for businesses, schools, universities, colleges and charities. For more information, please visit www.therockworks.com.